Annie Weaver always planned to return home, but the 20-year old RN has lived in Philadelphia for three years now. As her time of rumschpringe is about to come to an abrupt end, bringing for Annie an overwhelming sense of loneliness. She returns home and finds herself face-to-face with a budding romance with an Amish farmer and important choices to make. 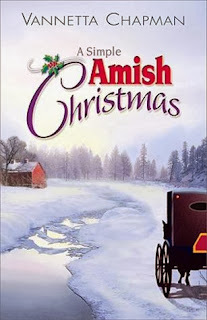 I have read several of Vannetta Chapman's Amish fiction novels. This one was actually written in 2010 as her debut novel. I hadn't realized until after I had finished it but found that a fun fact! Annie has spent 3 years living with her aunt, amongst the English. She finishes high school and gets her 2 year nursing degree. She enjoys being a nurse and caring for those around her. She is called back 'home' when her Dad has an accident. Annie returns to care for her father as he refuses to stay in an English hospital. God has provided Annie with the skills to help her father and those in her community as she returns to her Amish roots. As Annie works with Samuel, a 'healer' in the community, he begins to see she is much more capable of caring for people than he once thought. He even asks for her assistance with other people needing care. Perhaps there is a chance at her finding a husband after all? I love the simplicity of the Amish and with Annie having lived in the English world for 3 years she is able to see even better what she has missed. I have always enjoyed seeing the culture come alive through fiction novels, giving us a glimpse into the lives of the Amish. Vannetta Chapman does a fantastic job giving us an insight, and bringing Christ into the focus. The Amish aren't without problems and concern as this book shows, but as a Christian it will determine how you tackle it.